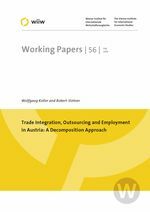 In this paper we study the employment effects of changes in the levels and patterns of trade integration and outsourcing in the Austrian economy over the periods 1995-2000 and 2000-2005. Based on an input-output framework, we apply a hierarchical decomposition analysis to disentangle the employment effects of changes in labour productivity, technical input coefficients and final demand components. Outsourcing is modelled as changes in the shares of domestically produced intermediates. For this some further details can be derived by distinguishing between intermediate imports according to educational intensities of the imported intermediate products. A similar decomposition of the final demand vector allows then to draw conclusions on the employment effects of overall trade integration over this period. We further calculate the employment effects, distinguishing three employment groups by educational attainment levels. The results suggest that the overall employment effect of trade integration has been positive in general. On top of that we do not find that the unskilled workers are hurt more than the other two skill groups. Further we find a distinct pattern of employment effects in the two periods considered: In the period 1995-2000 we observe relatively strong positive employment effects in the production of high skill intensive products and negligible effects in the production of low skill intensive products. However, this pattern changed in the period 2000-2005 where strong positive employment effects are found in the latter but even negative employment effects in the production of high skill intensive commodities.